According to both TheKnot.com and WeddingChannel.com, June is the most popular month for weddings, and thus, anniversaries. In celebration of this month of matrimony, as well as the 103rd anniversary of Hotel Galvez & Spa®, A Wyndham Grand® Hotel, couples are invited to renew their vows during a Wedding Vow Renewal Ceremony on Saturday, June 7 at 10 a.m. on the hotel grounds. A local Justice of the Peace will officiate the ceremony. Following the ceremony, a small reception will be hosted by the hotel. Couples have the option to join in the complimentary wedding vow renewal and can stay the night and enjoy the Hotel Galvez Wedding Vow Renewal package. Advance reservations are required for both. The hotel is rated four diamonds by AAA and is owned by the Cynthia and George Mitchell family as part of Mitchell Historic Properties. For reservations, call (800) WYNDHAM, or visit www.WyndhamHotelGalvez.com. Wyndham Hotels and Resorts, LLC, a subsidiary of Wyndham Worldwide Corporation (NYSE: WYN), offers upscale hotel and resort accommodation throughout the United States, Canada, Mexico, Central and South America, the Caribbean, Europe, the Middle East and China. All Wyndham® hotels are either franchised by Wyndham Hotels and Resorts, LLC or managed by Wyndham Hotel Management, Inc., or one of its affiliates. Additional information and reservations for all Wyndham hotels are available by visiting www.wyndham.com. Travelers have the opportunity to earn and redeem points through Wyndham Rewards®, the brand’s guest loyalty program, which can be joined for free at www.wyndhamrewards.com. Galveston Island is the No. 2 tourism attraction in Texas for in-state and out-of-state travelers. Galveston is a historic beach town located just 50 miles south from Houston, Texas – the fourth largest city in the U.S. A diverse cultural town, Galveston Island is a unique destination offering 32 miles of beaches, a variety of family attractions and resorts, one of the largest and well-preserved concentrations of Victorian architecture in the country and Texas’ premiere cruise port. 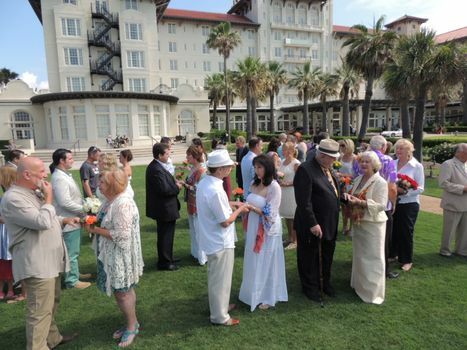 More than 20 couples participated in a wedding vow renewal ceremony hosted by Hotel Galvez & Spa and officiated by Judge Jim Schweitzer. Photo by Rhea's Photographic Art. 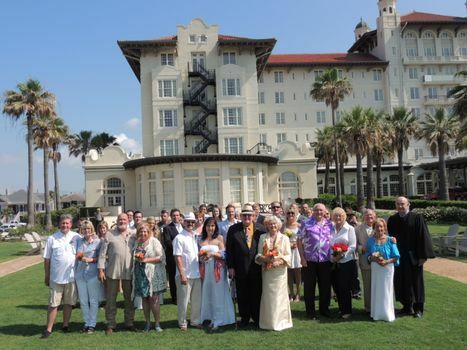 Hotel Galvez & Spa hosts an annual Wedding Vow Renewal in June. Pictured are participants from the 2013 event.